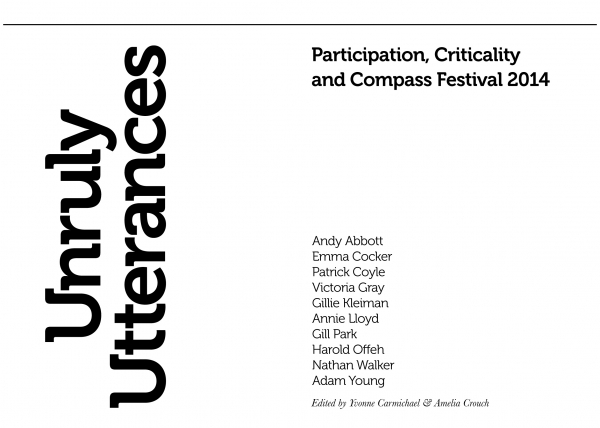 Compass Live Art is delighted to announce the publication of Unruly Utterances: Participation, Criticality and Compass Festival 2014. Keen to open up critical conversations about live art and socially engaged practice in the region we invited editors Yvonne Carmichael and Amelia Crouch to commission 10 practitioners from different backgrounds to reflect on the broad themes of participation, audience, criticality and writing in a series of short essays and provocations inspired by their own practice and numerous works in Compass Festival 2014. Thanks to a generous contribution from Live Art UK’s Enhancement Fund we are able to offer this unique work as a free download. A limited edition hard copy will be available from April 2015 at Compass events around the region.